The Assist-A-Tray is a combination of an easy-stand safety handle and swivel tray. The ergonomic safety handle makes standing and sitting easy and safe from your favorite couch or chair. 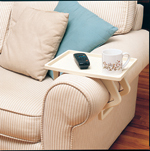 The swivel tray is a multi-use laptop/ TV tray with cup holder and utensil compartment. Adjusts in length and height to fit either side of the chair. Super grip rubber pads ensure stability and protect floor from damage. Tray swivels and arm pivots 360 degrees. Tray height adjusts from 26 in to 32 in. Handle adjusts from 34 in to 40 in. Handle dimensions are 6 in x 6 in. Base length adjustment is 20 in x 36 in. Tray measures 16 in x 18 in. Weight limit of tray is 30 lbs and handle is 250 lbs. Sturdy steel construction. This makes it so much easier for my husband to get food on h ..